The frequent connectivity issues are a dealbreaker, especially at this price. 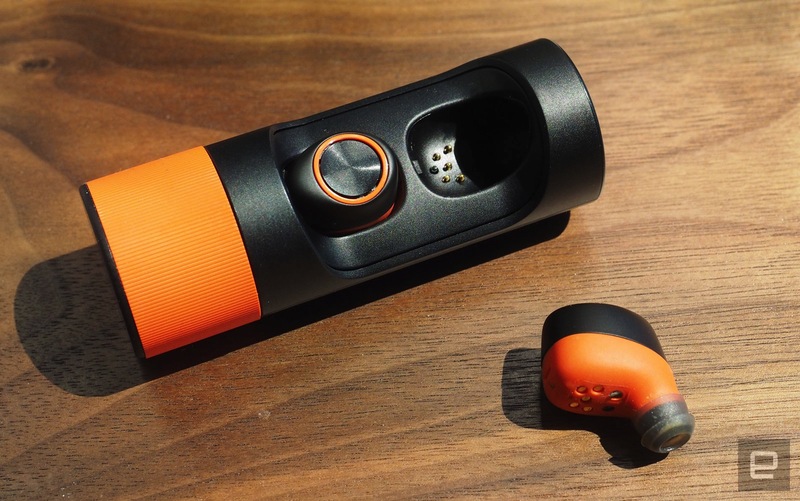 In June, Motorola unveiled its VerveLife line of "lifestyle" products, with the VerveOnes+ wireless earbuds being the first to go on sale. These are truly wireless, existing as two independent pods that you wedge into your ear holes, with no wires or headband to be found. Needless to say, I was excited at the prospect of ultracompact Bluetooth earbuds -- especially after reading about the Bragi Dash, a similar device. Sure, these headphones will be easy to lose (something the company addresses), but having a semi-smart audio system without tangles that's easy to stow in your pocket ... that seemed like the future. Sadly, while there are some useful features and the sound quality is indeed respectable, the form factor itself still has some lingering issues -- most notably, drops in earpiece-to-earpiece syncing. That's a problem, given the $250/£230 price tag. The package includes two wireless earbuds and a charging case, which you'll unfortunately need to keep close at hand most of the time. The Hubble Connect companion app for iOS and Android gives you a place to customize the settings, but the buds will need to be inside the case in order for the app to connect with them. Without the app, you can still control playback, select EQ presets and connect to Google Now or Siri through simple button presses. If you misplace the buds, the app will help locate the last place they were synced, which is helpful, if only a bit. 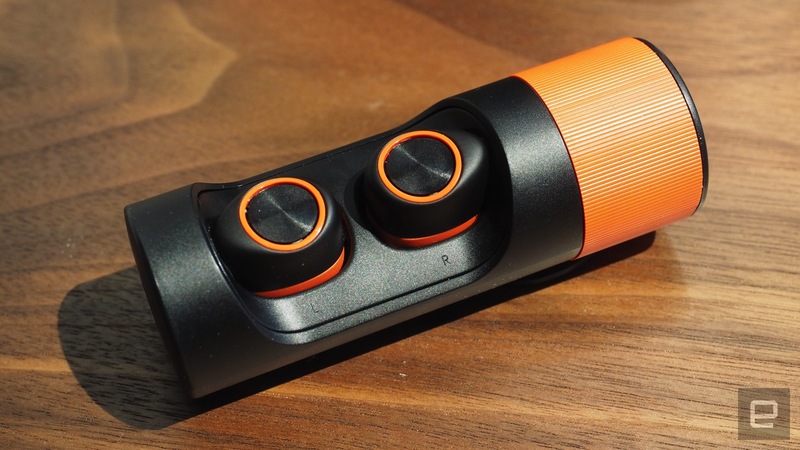 The orange-and-black design with matching charging case is attractive, but unlike in the press photos, the bulky buds don't sit flush and tend to hang awkwardly out of your ear. I suppose someone out there with larger ears than mine could pull these off better, but for me, it's tough. Sure, the battery and audio drivers add to their size, but the similar Bragi Dash manages a far sleeker design, with more features inside, no less. That's not to say the VerveOnes+ ever felt like they were going to fall out of my ears; they sit in pretty well but feel as big as they look. As a bonus, at least, IP57 waterproofing means they can withstand sweaty workouts and even the occasional dunk in a sink. There's definitely a trade-off of style for functionality, then, but even that doesn't seem totally worth it. The headphones have dealbreaker levels of audio dropouts between the left and right earbuds (and sometimes the pocketed source device), which makes listening a bumpy ride. A recent firmware update helped keep the signal solid while I was sitting at my desk, but go outside among the Bluetooth-emitting populace and it's dropout city. As for audio quality -- dropouts aside -- they sound pretty good. Motorola, which actually licensed this product from Binatone, hasn't revealed the frequency range, but they have 6.8mm dynamic drivers providing what's described as "deep, rich HD sound." That's not much to go on unless you've given them a listen yourself, but the bass is indeed deep and full, with solid midrange tones and generally crisp highs, especially with high-resolution audio files. These earbuds also support Bluetooth aptX, so if you have a phone or player that supports the format, you can expect CD-quality wireless listening. To tweak the output, you get six preset EQ profiles to choose from: Bass, Brilliant, Balance, Rhythm, Live and Moto Sound. I've found Balance and Moto Sound to be the best for normal listening. To get a preview of the settings, press the earbud button on either side for six seconds while music is playing. It'll cycle through the options. Press once to lock in your EQ when you find one you like. Other system options include Ear Detect: An IR sensor switches the buds on once inserted into your ear, and vice versa. There's also Voice Answer for taking calls using the onboard dual mics, and Pass-Through, which lets in a tinny version of the outside world. While this definitely helps, it's not a safe-enough (or often legal) solution for cycling, and wind noise also becomes a major problem with Pass-Through enabled. All of these settings are supposedly accessible through a six-second button press (without music playing), but so far I've only heard a prompt for toggling either music or video mode (something not indicated in the manual). Still, these are generally options that you'll set once, which you can accomplish easily through the app while the earbuds are stowed in the case. One of my favorite features is using Google Now (since I'm on Android) for verbal inquiries or turn-by-turn directions when walking or biking. You can trigger access with a long (but not six-seconds-long) press of the left earbud button until you hear the Google "listening" tone as it accesses your phone. Saying "walking [or biking] navigation directions to a [specified location]" usually took me right into spoken prompts indicating where to go. I usually prefer not to plug up both ears with headphones when I'm out and about, so I've taken to using one. Incidentally, that also solves the annoying audio-dropout issue. Having a single earbud that can serve up music from your phone and provide one-click access to Google Now for searches, random info and especially directions is actually pretty great. Unfortunately, if you have Ear Detect on and happen to drop them into your pocket for five minutes or more, the buds will go to sleep and only the charging case will be able to wake them up. 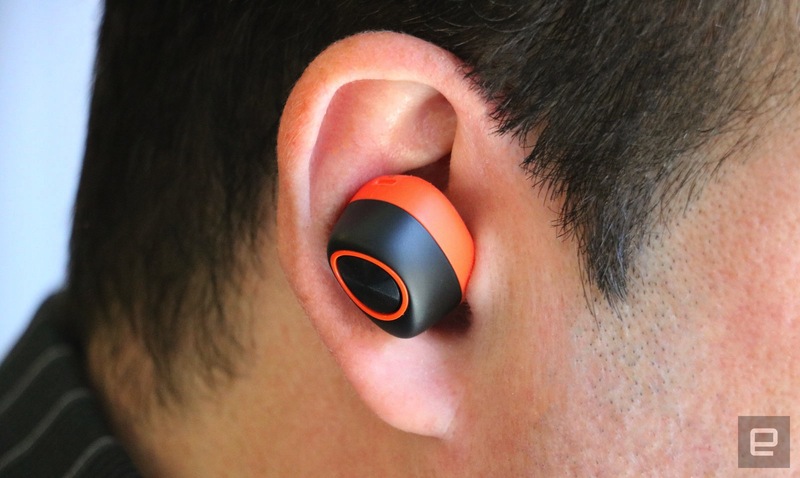 The workaround is to turn off Ear Detect, leaving the earbud on continuously. Your freedom will only last as long as it takes for each 72mAh battery to run down, which is listed as about three and a half hours per earbud while in use. The 600mAh charging case also provides an additional charge, giving you enough juice for a total of more than 12 hours of playback time once you re-up. The 115-hour standby claim also seems valid. I've left them in my bag (in the charging case) for four or five days, and they usually still had a healthy charge. When I first tried these headphones, they seemed like an obvious skip. If I had paid good money and the earbuds cut out as much as they had, I'd be clamoring for a refund. I had high hopes that the recent firmware update would improve their ability to stay connected, but that only helped while indoors with few people around. 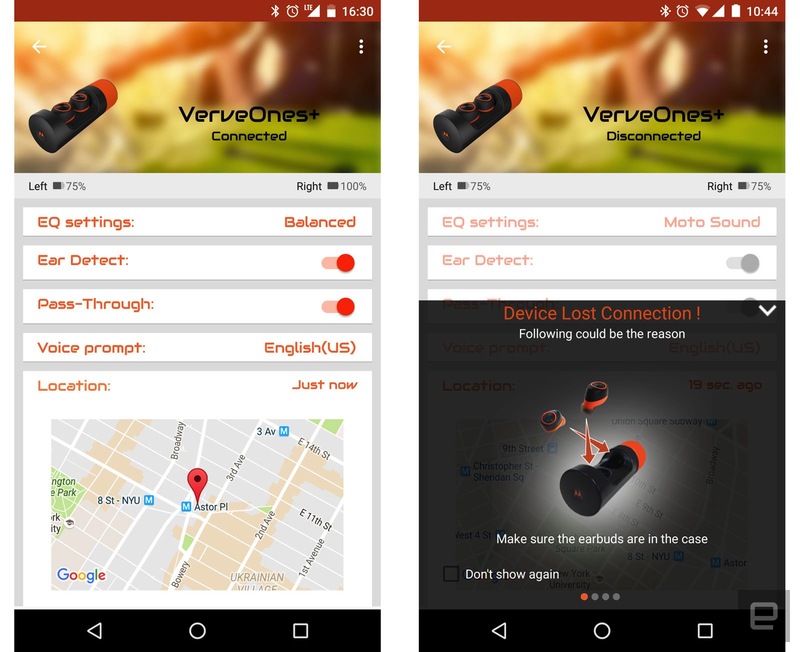 It's not just the Motorola VerveOnes+, though, that have difficulty with earpiece-to-earpiece and source-device connectivity. Erato's Apollo 7 buds and the Bragi Dash suffer some of the same problems, but the Dash at least has onboard memory, so you can listen to tunes without bringing a phone (and without suffering any dropouts). And again, they also offer a sleeker fit, which is important in a product with this form factor. I look at these headphones as examples of fledgling technology: still at the mercy of what's technically possible. If you can afford to experiment, you may get some enjoyment out of these earbuds, but for $250/£230, most will be disappointed. Truly wireless seems like a great idea, but the connectivity -- a key factor here -- is still not where it needs to be.